In PassPort a role is a grouping of privileges. In this scenario two roles are created; Superhero and Sidekick. The Superhero role has full access to the lair, the Sidekick role has read-only access, and everyone else has no access. 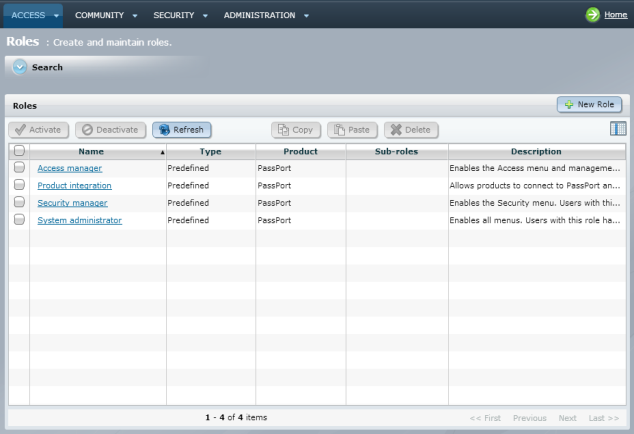 In the PassPort Administration UI, select Access > Roles. In the New Role dialog enter the name Superhero. Click Next. Select the Modify Lair privilege and the View Lair privilege. Click Finish. To create the Sidekick role, repeat the above steps but this time enter the name Sidekick and only select the View Lair privilege.